Obituary for Caroline (Kezele) Levinski | Hillside Funeral Services Ltd. It is with sadness that we announce the passing of Caroline Levinski. Carole was predeceased by her husband Albert Levinski, her son Jeffery Levinski and her grandson Andrew Levinski. She will be sadly missed by her son, Ernie Levinski, and his wife, Kathy Levinski; granddaughters Carly and Natasha Levinski and grandson Nicholas Levinski. Carole will be remembered as a selfless and caring person; she was always concerned about her friends’ and family’s health and well-being and had a special fondness for children and animals. Born in Croatia in the former Yugoslavia, she emigrated to Canada in the late 1930’s. Carole learned to speak English and excelled at academics in high school. 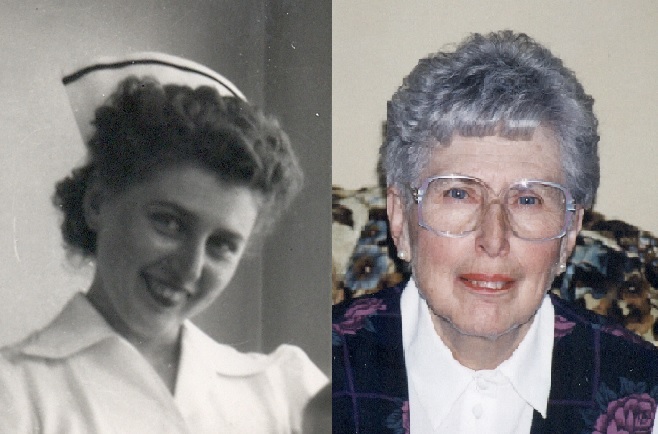 She graduated as a registered nurse in 1947 from the Toronto East General Hospital. She taught nursing at Northern College in Kirkland Lake and became a head nurse at the Kirkland Lake and District Hospital. She loved helping others – especially through her work in the maternity ward. Upon graduation, she interned in New York City but returned to Kirkland Lake where she met her husband and started their family. Carole liked the outdoors; walking, cross country skiing, golfing, gardening and the odd glass of red wine. She never drove a car and would walk to work in all kinds of weather which likely attributed to her long and healthy life. She never skipped a beat until the end. A celebration of Carole's life will be held in the spring.